According to Giora Katz, Rafael’s vice president, remote-controlled military hardware such as Spot and Shoot is the face of the future. He expects that within a decade at least a third of the machines used by the Israeli army to control land, air and sea will be unmanned. According to analysts, however, Israel is unlikely to turn its back on hardware that it has been at the forefront of developing – using the occupied Palestinian territories, and especially Gaza, as testing laboratories. “These systems are still in the early stages of development but there is a large and growing market for them,” said Shlomo Brom, a retired general and defence analyst at the Institute of National Security Studies at Tel Aviv University. 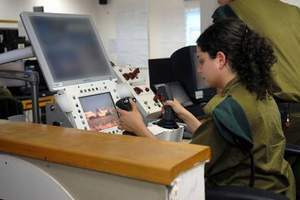 The Spot and Shoot system – officially known as Sentry Tech – has mostly attracted attention because it is operated by 19- and 20-year-old female soldiers, making it the Israeli army’s only weapons system operated exclusively by women. The Israeli military, which enforces an unmarked no-man’s land inside the fence that reaches as deep as 300 metres into the tiny enclave, has been widely criticised for opening fire on civilians entering the closed zone. Another piece of hardware recently developed for the Israeli army is the Guardium, an armoured robot-car that can patrol territory at up to 80km per hour, navigate through cities, launch “ambushes” and shoot at targets. It now patrols the Israeli borders with Gaza and Lebanon. Its Israeli developers, G-Nius, have called it the world’s first “robot soldier”. But Israel is most known for its role in developing “unmanned aerial vehicles” – or drones, as they have come to be known. Originally intended for spying, and first used by Israel over south Lebanon in the early 1980s, today they are increasingly being used for extrajudicial executions from thousands of feet in the sky.